You may have visited an animal shelter and noticed the amount of homeless cats and dogs waiting for you to take them to a forever home. Unfortunately most of those that are seen never find a home, they are euthanized because there are not enough homes available. You may have quit visiting shelters because of your anguish over this all-too-true fact. Our mission is to help curb the overpopulation of homeless pets by spaying and neutering. The way we intend to accomplish this is by helping to provide low-cost spays and neuters to families who cannot otherwise afford it, spaying and neutering shelter animals at little or no cost, and spaying and neutering feral (homeless, on-the-street) cats in a program called TNR (Trap, Neuter, Return). It does no good to just trap and kill these ferals. It has been proven time and again that another will come in to take the absent one's place. And this replacement animal will be unaltered, continuing the cycle of overpopulation. Don't want that kitten that is a little "wobbly"? 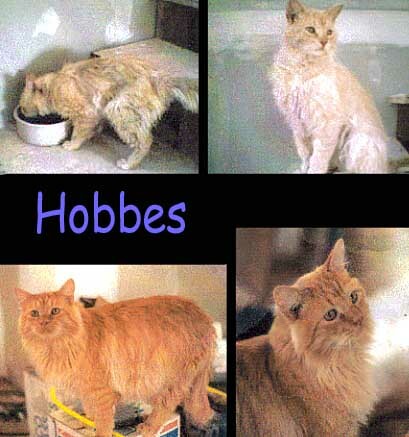 Hobbes was a stray that was caught by animal control. By mistake, he was allowed to be adopted instead of killed. 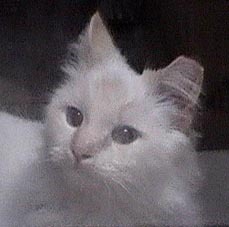 I had him neutered and look what a gorgeous boy he turned out to be! Because you may find a gorgeous creature like Chubby. He was part of a feral colony of 30 that we had TNR'd. I told the caretaker that if any were adoptable I would find them a loving home. Chubby has that home! He also has his Badge of Honor (a tipped ear) indicating he is a true survivor. We were also able to get a teen and a baby homes too (after careful, loving fostering, and taming, of course). VOLUNTEER!! If you live in the Southern Utah area, we can use your volunteer help. We need grant writers, transporters, adopters, foster homes. If you would like a little background information on our endeavors, the local newspaper wrote a very good article in the Hurricane Valley Journal describing our ventures. Although some items are not entirely accurate, it was still very nice. The Thrift Store has been closed due to competition, but it was great to get to know the animal lovers in our community. SHOP We have signed up under several programs for donations to our non-profit. If you like to shop online, you can make a donation while you shop at certain stores (the program pays for the donation)....painless and costs you nothing just by shopping online for brand-name stuff at over 657 well-known online stores. Yes, even eBay! Go to our Donation page and pick the type of donation you would like to make. Paypal makes it easy to donate online. If you wish to send a check, we WILL accept that too. TARGET St. George We are pleased to announce that Target Stores in St. George has offered to help our feral program with foods and volunteers! By shopping at Target, you are helping to support their generosity.